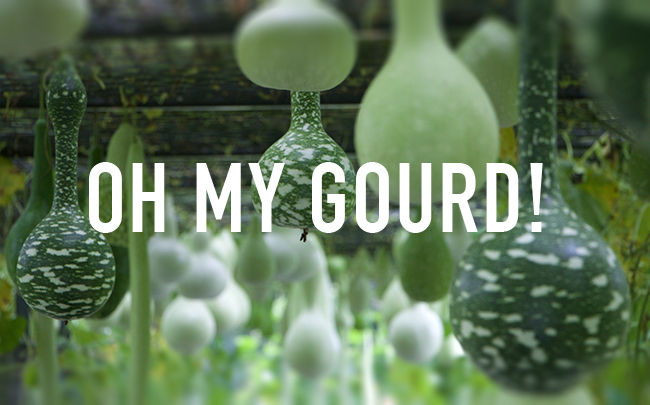 Bottle gourds (such as these Lagenaria siceraria planted in a gourd tunnel at the home of Amy Goldman) may seem far removed from the other more well-known Curcurbita, but they are undeniably gourds, useful for everything from vessel making to musical instruments in some tribal cultures. All puns aside, the cucumber family - Cucurbitaceae in Botanical Latin), dominates the late summer vegetable garden. Given the familiarity and diversity of the countless of varieties of Cucurbits in our diets and decor (think: squash, cucumbers, pumpkins, melons and gourds) one might assume that there are hundreds and hundreds of species given the diversity, but don't let that riot of color, texture, flavor and usefulness mislead you - although taxonomists argue as to precisely how may species there actually are, what I found most interesting, was what I didn't know about Cucurbitaceae. In our garden, there are many heirloom cucumbers coming in right now, and there are pickle jars on our counters, and in the refrigerator. 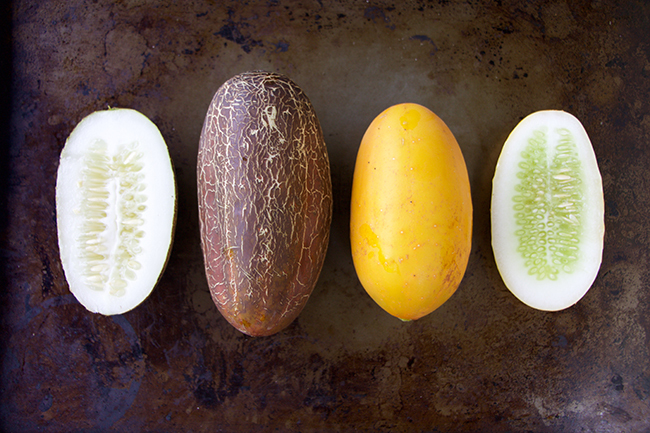 On the left, a red, heirloom Sikkim cucumber I grew this year, and one called 'Small White', on the left, one of the many white-skinned types, which mature to a bright yellow. 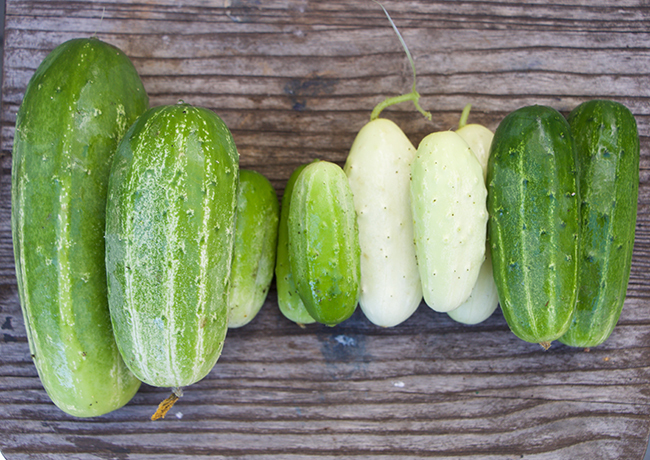 I knew much already - that cucumbers are related to watermelons, and that all including squashes and pumpkins are considered cucurbits, but I found the fact that not all share the same genus and species, more than a little interesting. Even more curious, was that I often confused the details, as the genus of some, sounded similar, so here is a primer to the family Cucurbitaceae (don't worry, not too geeky, just a few facts to make you sound smaht.). Not all Curcurbita are the same. Sure, they are related, but when one begins to look at the actual Latin names of familiar ones (like Luffa Squash, and cucumbers which I had already assumed were from a different genus, but I never knew that Cucurbita was not only Latin for 'gourd' and a term used to group all those within the plant Family Cucurbitaceae, but that it is also a Genus itself, and one which should never be confused with the genus Cucumis, the genus which includes Muskmelons (Cucumis melo) - which, are grouped along with cucumbers (Cucumis sativis), while Watermelons are a completely different genus altogether (although, one may think that they were closer to cucumbers than muskmelons are.). Call it lurking, or call it stalking (OK, maybe this verged closer to stalking), but hey, I'm man enough to admit it. Plus, this is a true story. It all began two years ago when I purchased a couple of these Elevated Raised Cedar Planter Boxes from Gardener' Supply Company. You probably know that we have multiple gardens here, some are raised beds - those which sit on the ground, and then we keep loads of containers which contain tomatoes, peppers and ornamentals, but given my schedule, and lack of time to weed, I've been looking into more and more raised beds - the sort which are truly elevated (bending over is highly over-rated!). I should also mention, that with me, aesthetics count - they have to look nice. I had no intentions ever of writing a blog review on this product, or to represent a product like this, but something happened. I ordered a new style of raised bed from the Vermont based garden retailer Gardener's Supply a couple of years ago, and fell in love with the product so much, that I then bought another one the following year. I should also preface this post with my interpretation of this 'not-so-sponsored-post' - the lines are blurred in my book when it comes to writing about a product which I already used, and one which I believed in so much, that I made the effort (stalked) the distributor myself, seeing if I could review it. So yes, it was I who contacted Gardener's Supply - gushing about this product, and it was I who offered to write about it. And know this - it took some work for me to convince them that I should review one for them. It was mid to late season already, and they were already focusing on holiday concerns. Even so, as one of my designers at work said to me "Why are you putting so much effort into this? Isn't this that catalog that sells ladies gardening gloves with pretty flowers and the matchy matchy rubber boots?"). "Yeah - that one", I replied. I don't even really know why I was trying so hard to reach them, but it just became 'a thing' with me. Call it bruised ego, or uber effort on my part, either way, I really like this thing, and felt the need to not only recommend it, I wanted to experiment with a few new ways to use it (like - for wintering over alpines and primroses, which I expect will appeal to very few of you, but, to those of you who care about raising such things as auricula primroses, this product may be the greatest discovery of the decade. 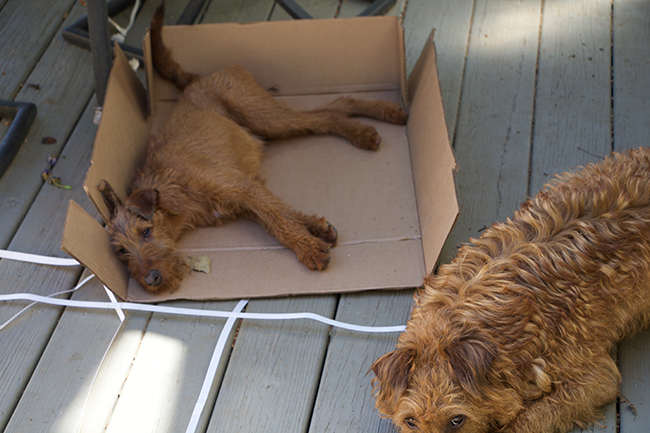 The dogs rest in the corrugated boxes that our latest raised bed arrived in from Gardener's Supply. I've been casually consuming from Gardener's Supply Co. for about 20 years now and for those of us who garden, they fill a niche selling training devices, trellis' and things like tomato boxes. At least, that's what I order from them - they do carry many more products ranging from seasonal garden supplies, to seasonal gifts (like flowered gardening gloves and matchy waterproof colorful boots which, my sister really wants). Not to mention that the company seems pretty great to work for. Socially responsible, every employee is an owner - a good-corporate citizen, which I can appreciate. It's a company with good values. 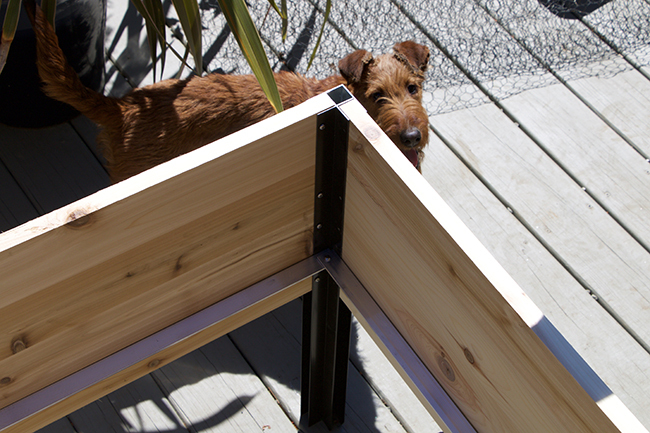 I ordered my first Elevated Cedar Planter Box in the spring of 2012, intending to use it for tomatoes. I had been using their plastic tomato growing boxes for years, to reduce soil borne disease and virus' especially for tomatoes and peppers, but they never really looked that nice on the deck, but when I saw these raised beds with straight sides and straight legs, everything changed. Actually, every changed once I ordered one and saw how well it looked in the garden, and the quality of the product. 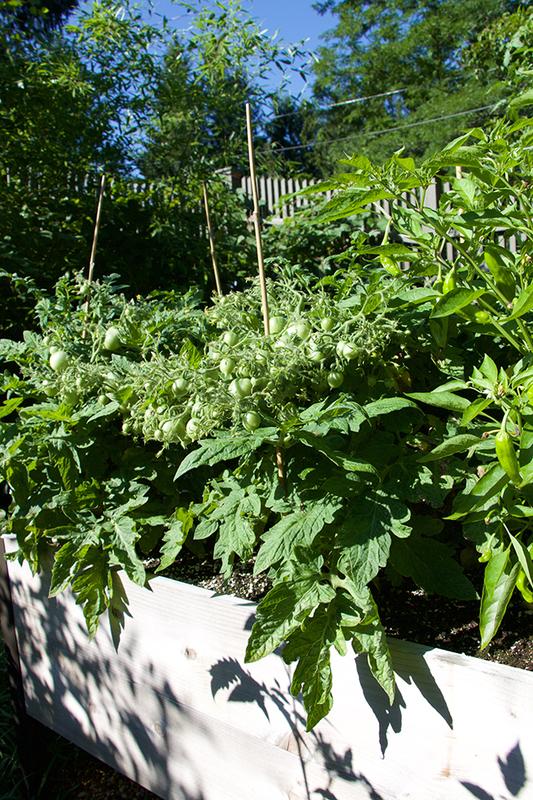 Mini tomatoes ('Geranium') and Shishito peppers still producing lots of fruit in one of my elevated cedar beds. 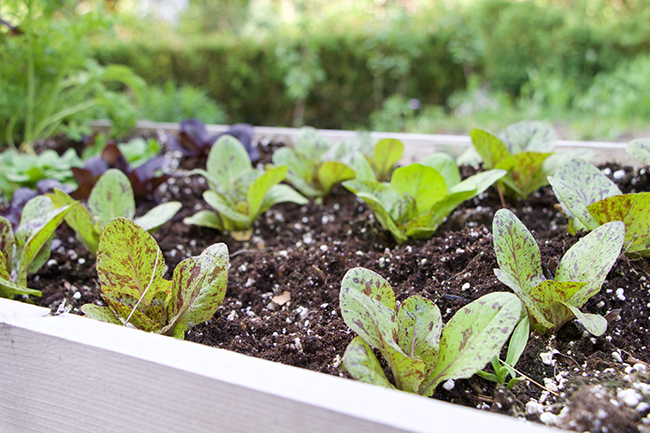 Not all raised beds are created equal - these have deep beds for solid root run, and straight sides which are deep enough for one to raise root crops if one wants to. I vowed to convert most of my kitchen garden raised beds into these elevated beds, keeping longer rows of more useful high-crop vegetables such as beans, potatoes and corn for a tilled garden out back. For things like kitchen tomatoes, herbs, fast salad crops which need to be steps from the kitchen door, these are perfect, they are convenient, keep the weeds and virus' at bay, and they look great - but beyond that, I am finding that these elevated beds are more useful off-season - for quick crops of greens, winter veggies and even for winter culture and care - primroses, alpine plants in pots, and even for propagation. With the addition of the cold frame top, these prove to be very useful in providing the perfect conditions for starting seeds of species which require winter stratification - which includes many tree, shrub, woodland, alpine and perennial species such as those made available in winter seed exchanges from NARGS (North American Rock Garden Society) and other alpine clubs. 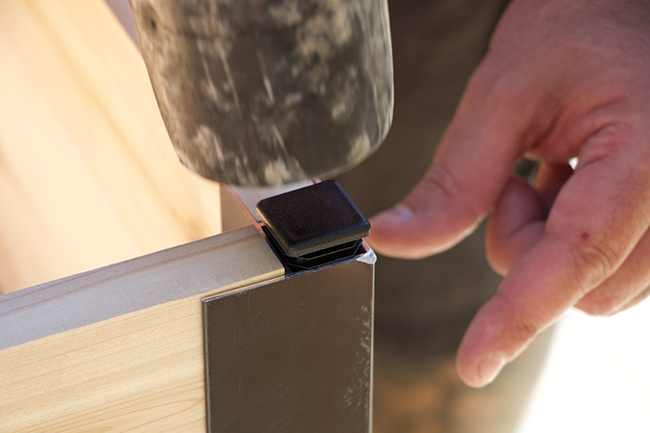 Assembly is quick an easy with these beds, but that doesn't mean that they are not constructed with well tooled materials. Here are some facts -- these beds are very deep, nearly 20 inches, which makes for more consistent soil temperature both in the spring, as well as in the autumn and winter. They are available in a few sizes, but the larger size is nice a big at 8 feet long. I can hardly find anything wrong with them (aside from the price for the soil-less mix or potting soil needed to fill them with). One will need two bales of Pro Mix BX to fill one of these, so factor that into your expected cost. The actual cost of the beds themselves is around $275.00 if you order one ''in-season', (they are on sale right now for a limited time for $237. Not unreasonable in my book, since the cedar wood and aluminum alone would cost nearly that much, but the straight lines make the entire purchase totally justifiable). I've spent money on crazier things. 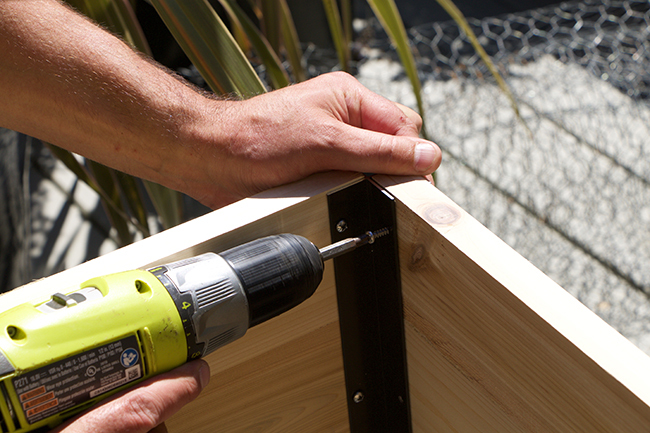 You will only need a screwdriver, a mallet and an extra hand when assembling these beds. 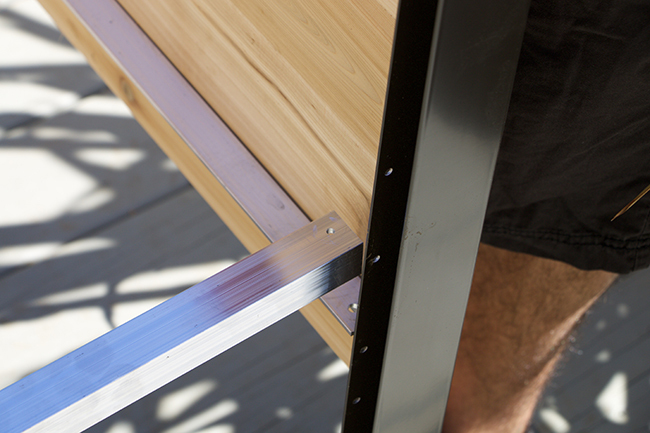 We've been able to cut the assembly time down to about 20 minutes! One of Daphne's puppies wanted to help. 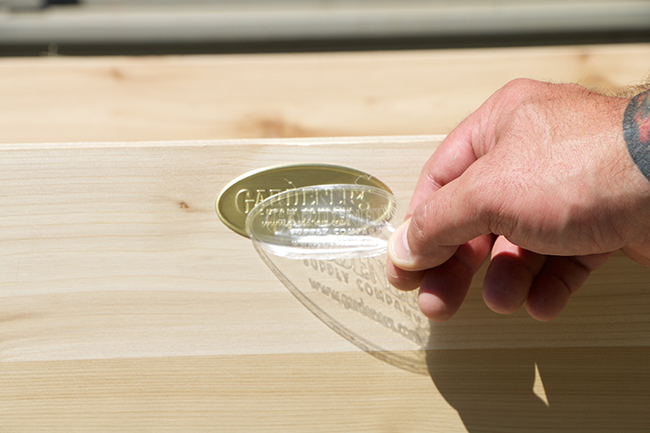 Every detail makes a difference. Not filled with soil, it is a little coffin-like! To sum it up, this bed, in my opinion, is better than any other bed I have tried, (mostly those set into or on the ground). It is not only attractive, but well designed, and of the highest quality, and it has the potential for multiple garden uses - not just for the home vegetable gardener who wants to grow tomatoes and peppers, but for one who may wish to raise a winter crop of veggies. More importantly, this bed offers a new way to garden for those of you interested in raising things like scented violets, auricula primroses and alpine plants - all old fashioned cold frame or alpine house plants which historically have been difficult to impossible to raise in America. I shared with Gardener's Supply the many ideas I have for this bed. I wrote about the types of posts I wanted write, and I shared how my past crops (which included napa cabbage, chinese cabbage, turnips, lettuce, pansies, english daisies and sweet peas) were so successful. I did this not because I wanted a free bed to write about but because I was seeing other posts on other blogs which were really fine, but which were tended to be more conventional - showing freshly planted tomato seedlings, or kale plants from a cell pack planted with marigolds. All perfectly acceptable treatments, but not really demonstrating the depth of projects which could be practiced by a more engaged plant person. My point was - that I could see this bed used in many ways, some more useful than just a bed in which one could raise tomatoes or kale. I was most interested in the available item which enhanced this bed - the cold frame top, an effective tool that could allow one to raise more than early spring starts, but also winter crops, and I felt that it could replicate an alpine house for those of us who needed that sort of tool. I also shared how I had recently used the bed to winter over my own collection of alpine plants, and how, if they offered me their new accessory of the cold frame top. that I could probably test this product as a device where serious gardeners could winter over their own alpines, or use it to start alpine seeds from the winter seed exchanges. Again, my approach here was to expand the use of this product beyond the use of it as simply a summer raised bed for basil, tomatoes and beans. It could really be a useful too for the more serious gardener who may not have the luxury of owning a greenhouse. In the end, they responded, I now have another bed, (and buying my 5th this week along with another cold from top). Consider purchasing any of the various sizes and models of these square-sided Elevated Raised Beds found at this link. 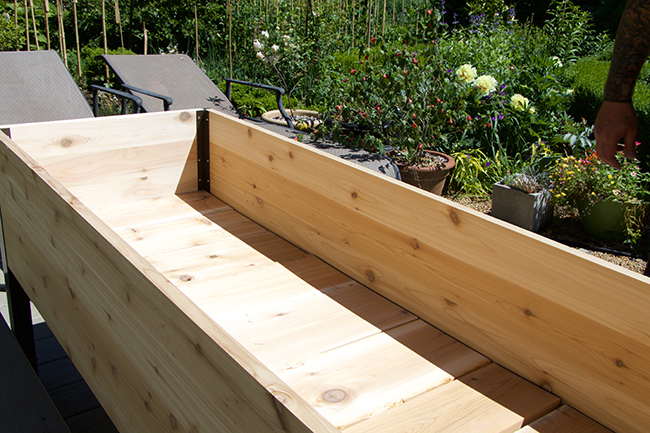 The version I have are the 2' x 8' Elevated Cedar Raised Bed on sale now for $237.89. but there are other sizes available. If you don't have a greenhouse, these will allow you to raise greens throughout the winter, and if you have ever wanted to raised alpine primroses like those seen in England, I know these will be perfect for that too - just set the pots into sand or a fast draining mix, with the cold frame top, and they will survive even the coldest winter - for remember - it's not the cold that kills these plants, it's the winter wet. I'll outline all of that in a future post when I set mine in for the winter. Seedlings waiting to be planted in raised beds this past May. If you are interested in raising some of the winter vegetable crops I am growing, I suggest getting, a Row Shelter Accelerator, which sells for around $16.95 each (less, since I ordered 2), which will help keep cabbage butterfly and other crop pests off of my Napa cabbage and arugula which I will be raising. After our first frost, I can remove this, or keep it on to extend the season in the raised bed. 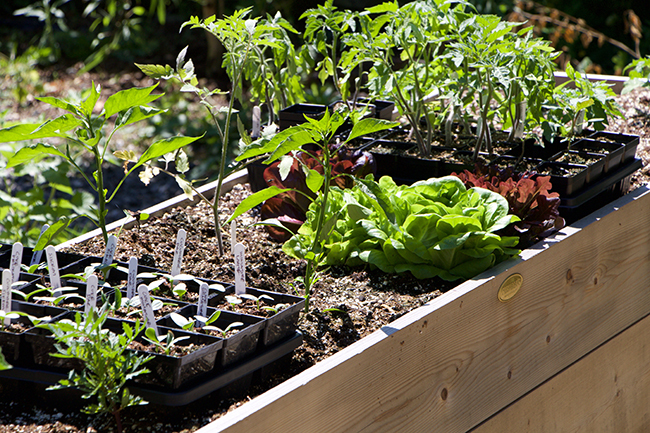 You can also use a floating row cover from Johnny's Seeds, or from another source. The goal here is to create a micro environment, that can keep insects off your Cole crops, and then eventually protect crops from severe cold, which may require the cold frame top. 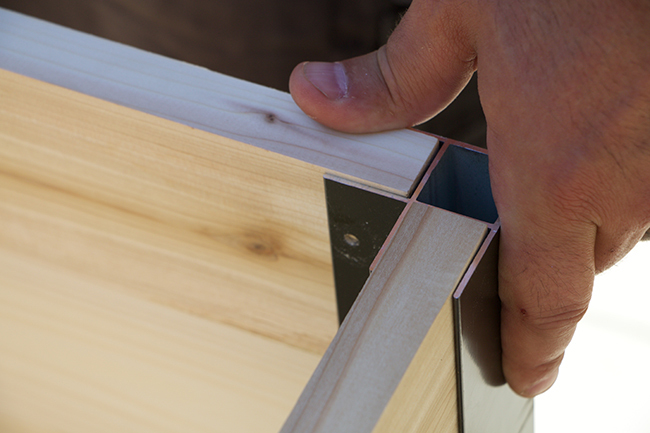 A key item which you will need especially if you want to winter over primroses or alpine plants in pots, is the Cedar Cold Frame, which fits on top of these 2 x 8' beds. I'll be sharing photos of it soon. I am so happy that they have added this, since last year I used a piece of ridged poly vinyl which worked well as a 'kit bash', but these new covers designed to fit tightly over the beds will be ideal. It will protect my potted alpines and seed trays which you may set into the soil to winter over without damage from snow, rain and winter wet, or it will help create a warmer, protected environment for cold-growing winter vegetable crops, or for protecting winter crops of biennials which have been started now in August, with the intent to set them out in the early spring for bloom - like pansies, English Daisies and foxgloves. You must be doing that! 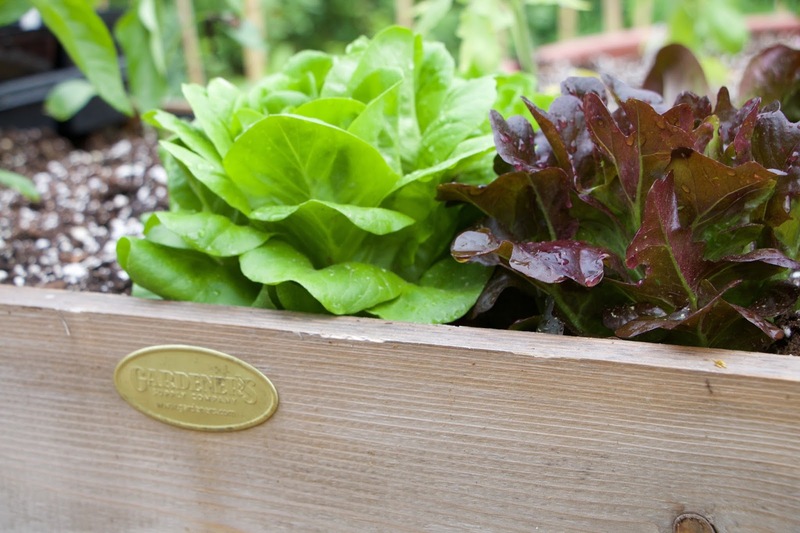 Dwarf and mini lettuce like these Salanova oak and bibb type remain small and bolt slowly, perfect for raised beds. I ordered my seed from Johnny Selected Seeds. More on those later, but I ordered kales, lettuces and arugula along with Napa cabbage (order dwarf varieties). These are all fall crops which should be sown in the next week or two including Napa or Chinese cabbage, arugula for the fall, turnips, rutabaga, spinach and lettuce. If you are wondering why I prefer miniature varieties, it's because they perform very nicely in containers, and although I realize that 'mini veggies' may sound odd, they are what most European gardeners already know as 'premium size', and I guarantee that you've already been buying some of these varieties at your local luxury market. 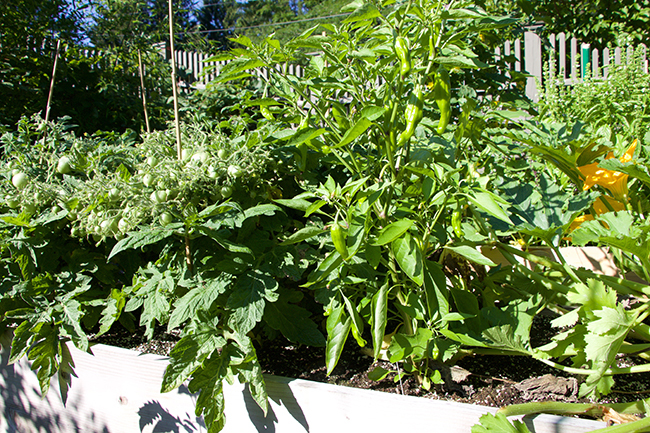 Earlier this summer, these two beds were full of veggies and now I am moving onto phase two. 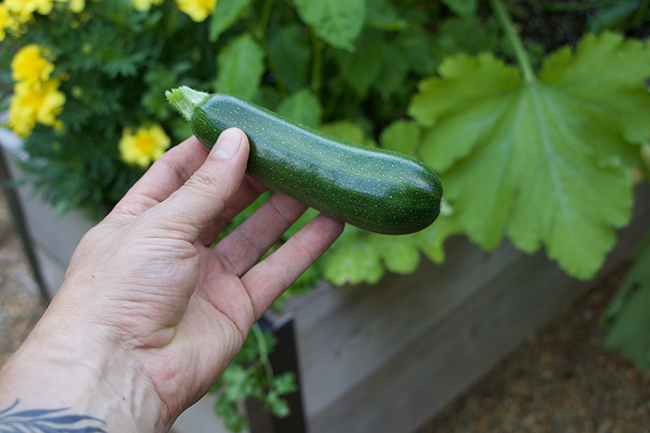 Can you believe that the zucchini is a dwarf mini one? See how large it is? As for cabbage, I am planting a dwarf variety of Chinese cabbage called 'Minuet', a mini Napa cabbage from Johnny's Selected Seeds, which I have raised in the past as a fall and winter crop which was great for kimchi and fresh eating. The heads were about 10 inches tall which isn't that tiny, and really - there is nothing as yummy as home grown Napa cabbage. Trust me. Kimchi will be on the menu this winter. Even though the zucchini is dwarf, the fruit was full sized and we had plenty. Plan on investing another $70 - $80 for good quality soil - I use ProMix BX, and these 2 - 8 containers will need two bales each. Of course, you can certainly use a peat free mix of your choice, but I highly recommend ProMix because most greenhouses and professional growers use it for that very reason - it simply is the best and I have never found a good substitute. However, a good peat-free mix which I would use if I could find it locally is Biocomp, which is made primarily with composted peanut shells. I will be sowing seeds later this week, and as my current crops mature, I will be converting my other raised beds into these crops. Stay tuned! 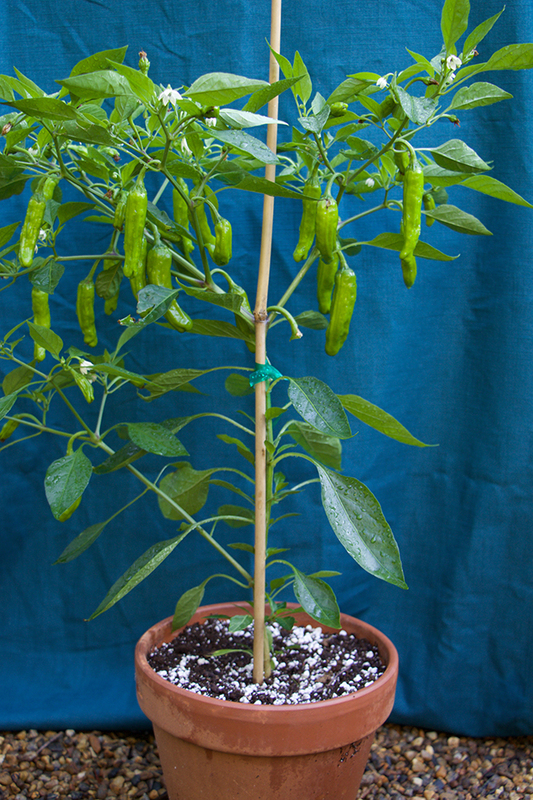 Shishito Peppers, the hottest food trend to hit the American garden since Kale, mature on attractive plants which I am raising in clay pots on our deck stairs. If you haven't noticed, it's officially 'high summer'. Sure, it's the start of what most gardeners call the harvest time - baskets of tomatoes, piles of zucchini, buckets of pickles and string beans, but early August is also that brief period when summer feels most-summerlike, two or three weeks before we start seeing hints of color in the swamp maples. Hot, humid days and cool, dewey mornings - a precious few warm and sultry evenings when one can dine outdoors with fewer mosquitos and the drone of evening insects. Firefly season is over, and late summer mushroom season is just beginning. 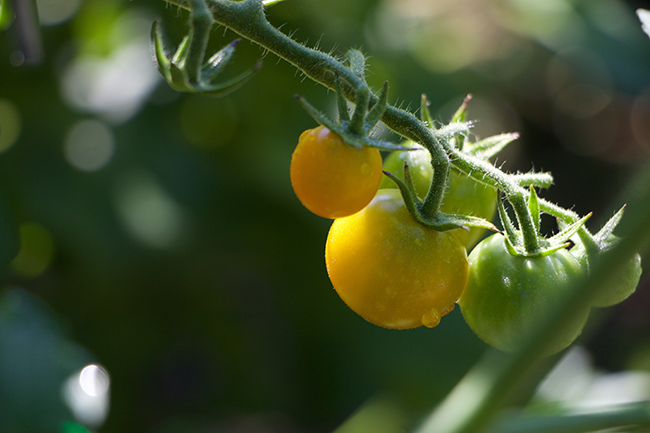 Golden cherry tomatoes are beginning to ripen on the vine. Few seem to make it into the kitchen, especially when they are drenched in a late day summer thundershower. I thought that I would just show some 'catch-up' photos from around the garden. Dahlias rule around here, as they begin to bud - we've plants far too many for any household, but with the new Dahlia Society we helped start (the New England Dahlia Society), we felt that we should plant as many as we could. 'Kelsey Annie Joy' Dahlia. Almost, too pretty. Almost. 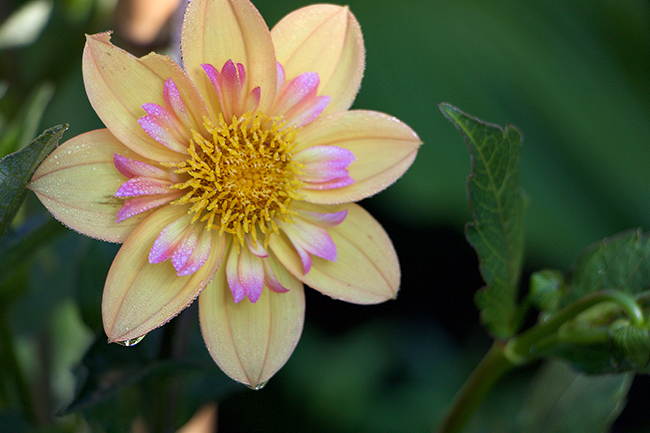 Dahlias are a bit of an obsession this year, but not all is going completely well with them. 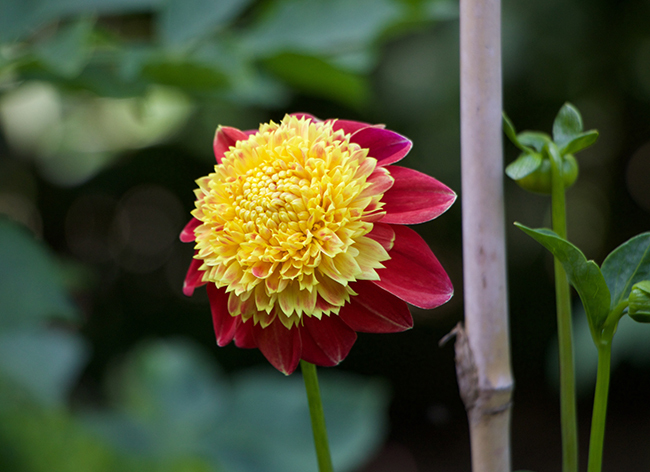 The 100+ dahlias which Joe and I purchased so eagerly this past winter, are all progressing but with mixed results. Raising dahlias for show is a completely different thing than raising dahlias for cut flowers. They are quite prone to insect damage, virus, rust and fungus. There is daily disbudding to do, and endless staking and fertilizing. Joe's field out back is proving to be too shady and weedy, and even though my 60 or so plants near the greenhouse are doing better, they need almost daily watering since we are experiencing an epic drought this year. Most of the dahlias in my exhibition bed - the bed where I am raising dahlias for local dahlia shows - are just beginning to bloom. This beauty is named 'Wowie'. Indeed. My days (or, after work evenings) are now are spent disbudding, staking and trimming away unwanted stems, all are efforts which help the plants focus on producing larger and more perfect blooms. This one is an anemone form - always a very pretty form in my book. Meet dahlia 'Alpen Fury'. In the vegetable garden, things are doing much better, although, I now wish that I had dedicated more space to tomatoes than dahlias! The hits this year are my new raised beds - the Elevated Cedar Planter Box - which I purchased at Vermont's Gardener's Supply Co. But more about those in a later series of posts - as I fell in love with that product last year - so much so, that I actually wrote them, proposing that I would love to write about them more. Now, I have four. A collection of Rhizomatous Begonias on the back porch, where they love the cool breezes and protection from full sun a rain. 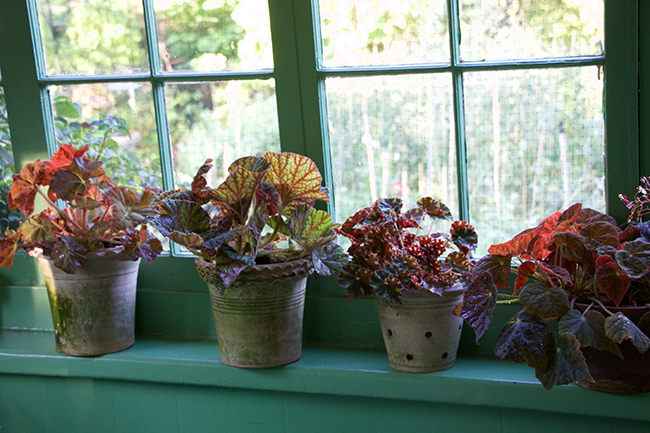 The perfect porch plant, these were small 2 inch pots in march, but quickly have grown to fill 6 -8 inch clay pots. Left to right- 'Desert Dream', ' Northern Lights', 'Kit Kat' and 'Autumn Ember'. This one is a rare species (one with a question mark on the label, which I purchased at a Begonia Society show last September). I really like its water lily -like foliage, and now, it is beginning to bloom. Check out these miniature tomatos - a variety with an off name - 'Geranium' . It is so dwarf and perfect, that it almost defies description - all of the fruit are born near the top of the plant, which is not taller than 1 foot. 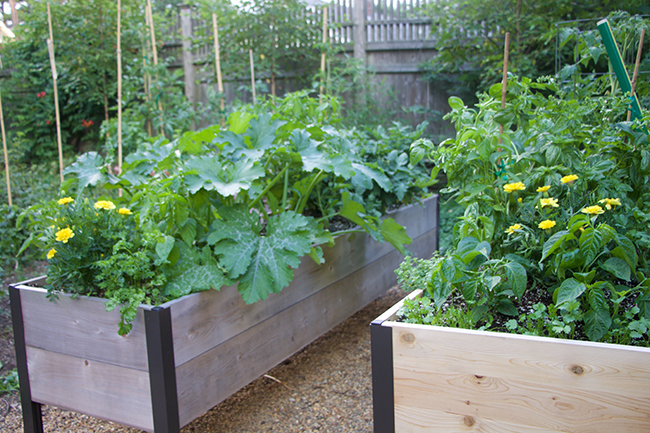 Perfect for these raised beds (the Elevated Cedar Raised Planting Box from Gardener's Supply - in which I raise many miniature or dwarf vegetables. The fruit are often the same sized as standard crops, but the entire plant size is smaller. As I mentioned earlier, like most of us, I fall in love with a few products and sometimes fall out of love with other brands and products. Owning this popular gardening blog does mean that I get emails most every day from agencies and brands, big and small, all who want me to feature a product in one way or another. Most are random, and either inappropriate or products I would never use. Others, are just not something even remotely related to gardening. When I read other blogs, I usually don't appreciate posts which feature products, or especially ones which look as if the company provided a free product to review, and then the author obviously must say nice things about the product. I wanted to prepare you for a series of posts coming up about a product I actually love, and one which I've seen featured on other peer blogs, but one which the company never approached me for. True story. I wrote them (multiple times!) to basically say "Hey, I really looovvveee this product, and I am already writing about it -multiple times - why didn't you contact me instead?" 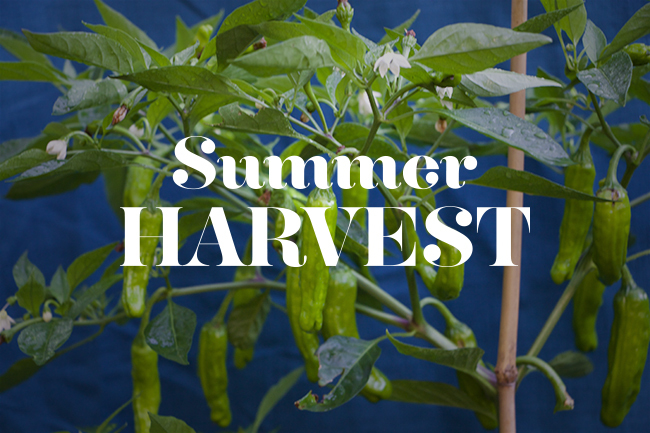 I want you to be ready for these winter crop projects. My tests last winter were spectacular. I wintered over auricula primroses another alpine primroses, and I really feel that once covered with the cold frame attachment that they sell, it will make a better than satisfactory alpine house for germinating hard-to-grow alpine seeds from the rock garden societies, as well as for wintering over other tender plants. My dear friend Abbie Zabar in New York City has a penthouse garden which always inspires me to add more topiary and especially olive trees, which she trains into tall standards. She once lived in Provence, so if anyone knows about these sort of things, it's Abbie. This motif feel complete, with some vintage terra rosa pottery planted with a mandarin orange, lavender, a myrtle, rosemary and an olive tree. 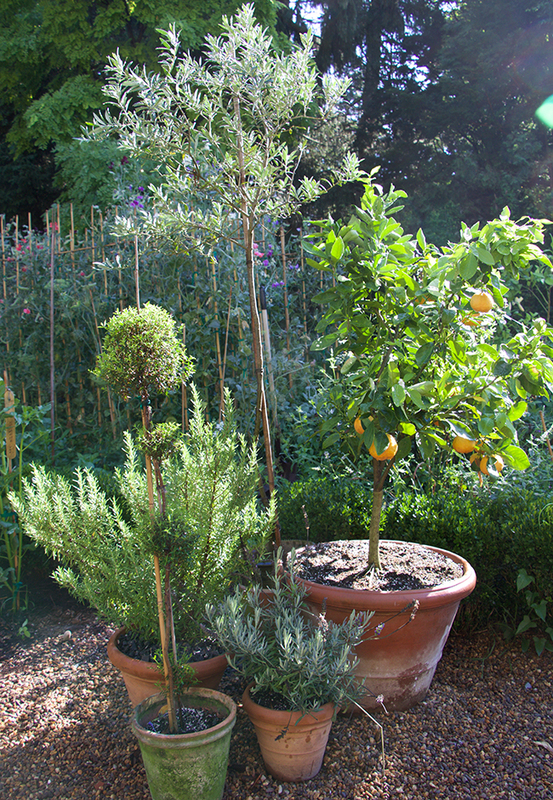 A dreamy corner in the veg garden which is very Euro-chic, and without really trying. 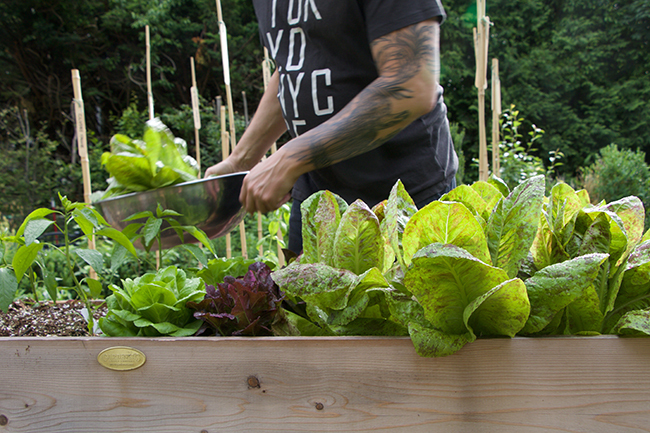 Are you getting inundated with vegetables from your garden? 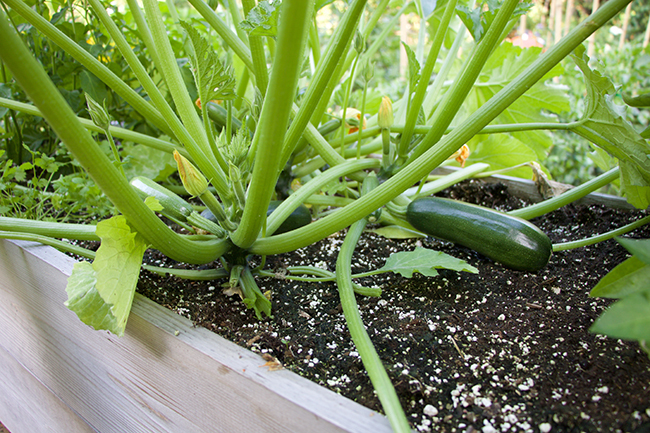 Tis the season for zucchini, tomatoes and cucumbers, not to mention beans, other summer squashes and peppers. Bring it on! Here is an interesting fact - my older brother doesn't even know that I grow vegetables at all. I love my brother, and he is a gardener too, but sometimes it bothers me that he teases me (or, he seriously taunts me) about this crazy idea that he has in his head that I don't grow many vegetables and if I do grow any, they are just useless fancy types. I mean -where does he get that thought from? OK, I know that I grow fancy chrysanthemums, and train fancy ornamental plants that look as if they are growing in France and then there is that greenhouse collection list with begonias, South African Bulbs and cacti, but you know what Bruce? I also grow a lot of veggies as well. In fact, probably more than you do. "Well", he said at a family party a few weeks ago, "I forget that you only really grow flowers". "I mean, you can't eat those sweet peas, right?". So, to clarify and defend the ugly rumors out there - here are a few more veggies that I am growing (I left the fennel and the red onions out of the picture. The onions are drying in the sun today. I am raising a preponderance of pickles this year thanks to these raised beds. Pickling cucumbers to be precise and they really appreciate the warm soil. Left to right, 'Delikatasse', 'Solly Beiler' , 'Miniature White', and 'Dar'. All heirloom and open pollinated varieties from Baker Creek. Not available for this photo - the giant red 'Sikkim' cakes which are just starting to fruit. I can't wait to see what those will look and taste like. Pickling cakes are some of my favorite veggies to eat, and these white heirloom ones are so tender and crispy that I don't even need to peel them. 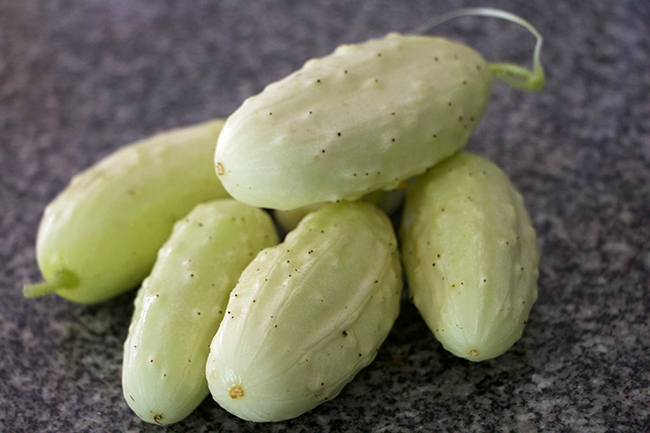 This variety has a rather unassuming name ' Miniature White', but among all of the white varieties, this one lacks the bitter flavor often associated with these types of cucumbers. 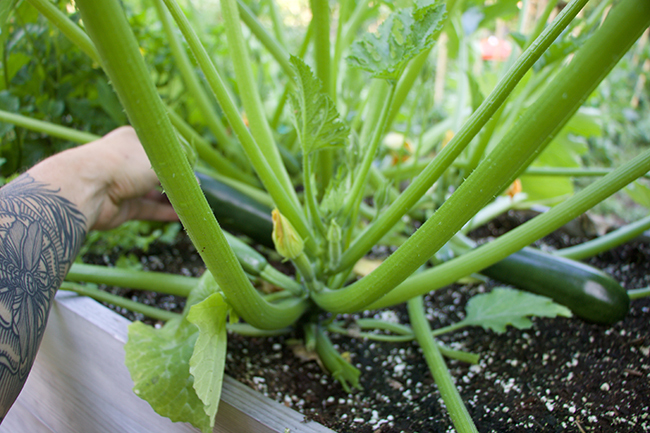 These raised beds are deep, and 8 feet long so roots thrive in deep, moist soil. I could have planted standard sized zucchini but this dwarf variety is large enough. The fruit is a bit smaller, but who really wants zucchini larger than a baseball bat? I always pick them small anyway, and now I have 'just enough'. Each plant of zucchini produced about 8 fruit, so 24 fruit was plenty for two of us. This week, I plant to pull the last ones off, and I will pull the plants, preparing the beds for fall crops which should take us into the late autumn, if not winter. Ordering seeds today for kale, micro greens, Chinese or Napa cabbage, and lettuces to sow now, since they germinate best in mid to late August. Maybe turnips, too. Shishito peppers are definitely getting a lot of attention this year. If you haven't heard about them yet, you will. I added them to my list of 2016 summer projects, and I am so happy that I did. (I planted currants and a collection of Gooseberries as promised, as well). 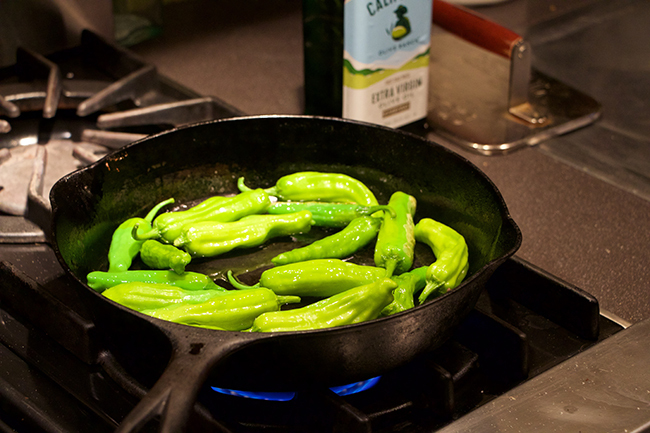 Shishito and Padrone peppers frying in a hot skillet. I've heard that they are the perfect accompaniment with a cool summer cocktail. Gonna try that! Shishito's are so popular at the hippest Japanese restaurants on the West coast, that they often sell out before the night is over. They are not hot (except maybe 1 in 100 they say, but I have yet to find it.). 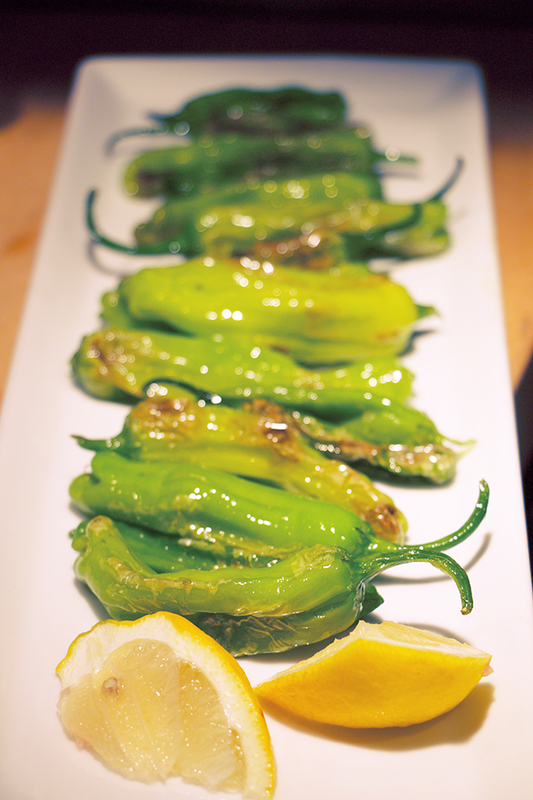 Closely related to the Spanish Padron pepper, it's a tender, thin-skinned treat. Cast iron skillet, hot and seared in a drop or two of olive oil, a squeeze of fresh lemon and sea salt - yum! Mild, sweet and tender. Seeds and all. 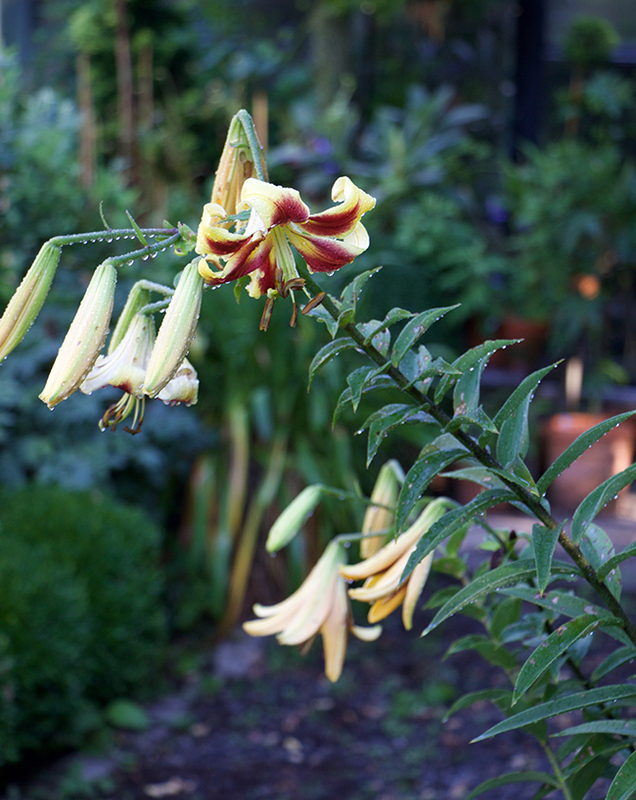 The last of the lilies are blooming - surely, a sign that summer is nearing the end. (OK Bruce, this IS a lily, which IS a flower. But I could cook and eat the bulb if I wanted to!). 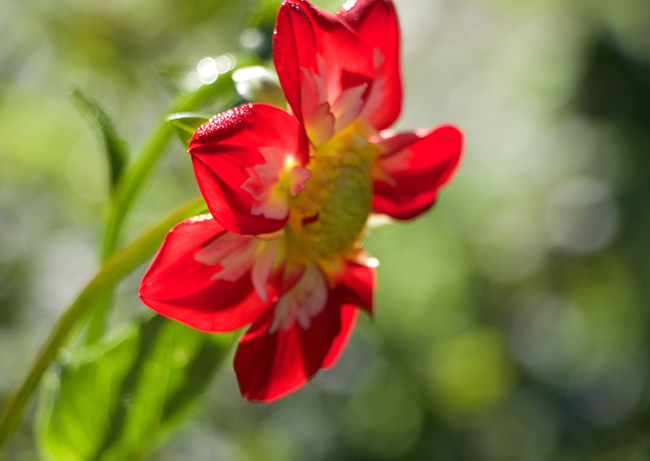 First, the dahlia has made a comeback, second - maybe the gladiolus, third, or at least on deck should be the tuberous begonia - an old-fashioned classic which deserves a revisit, or dare I say, a resurrection, since they are almost forgotten by most who garden today. 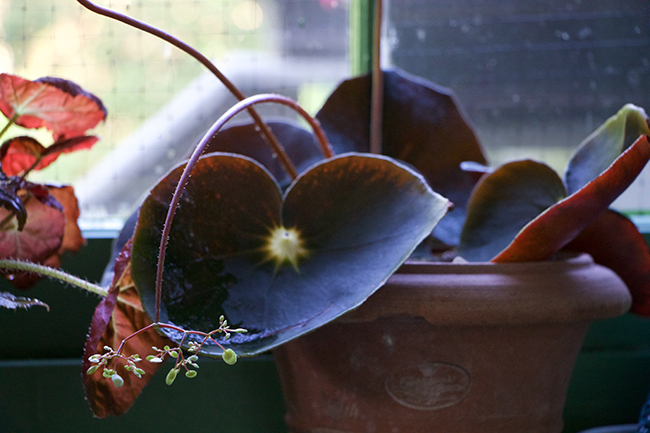 Let it me known that from this moment forward, I move that the tuberous begonia be considered as the ultimate summer potted bulb (tuber, really) for displays on decks, porches and even fire escapes. 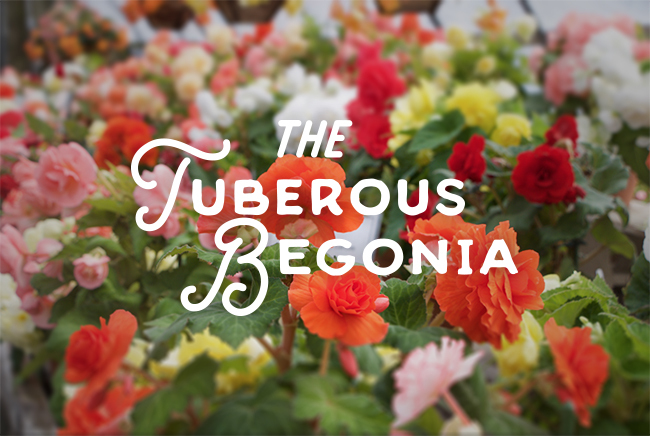 Suddenly, 'showy' is cool again, and believe me - nothing is showier than a giant, colorful pot of tuberous begonia blossoms in mid-summer. 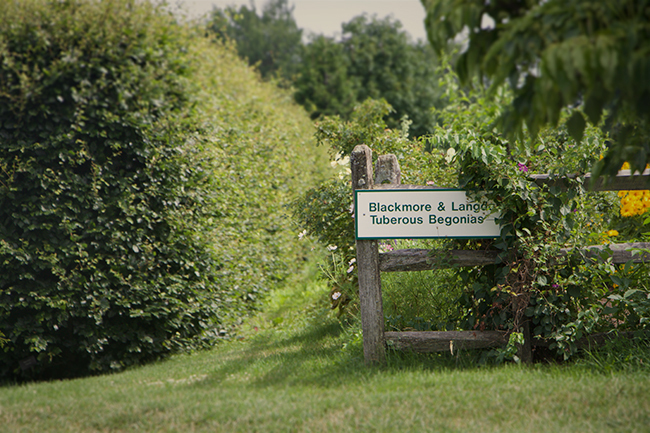 At Connecticut's White Flower Farm, a very special offering of tuberous begonias exists - if you live anywhere in the North East - a visit may be worthwhile - for the Blackmore & Langdon strain from the famed UK nursery, is by far, superior to Dutch strains which we so often find at home centers in the spring. A couple of weeks ago, while visiting White Flower Farm, I was treated to this amazing display of Blackmore & Langdon Tuberous Begonias. I remember seeing this collection 15 years ago (maybe even 25 years ago when I visited with my mom and sister!) , and I was thrilled and delighted that this American nursery still has made the effort to maintain a breathtaking collection of these tubers and plants, as well as offering these lovely (and admittedly, costly) tubers to the American market. 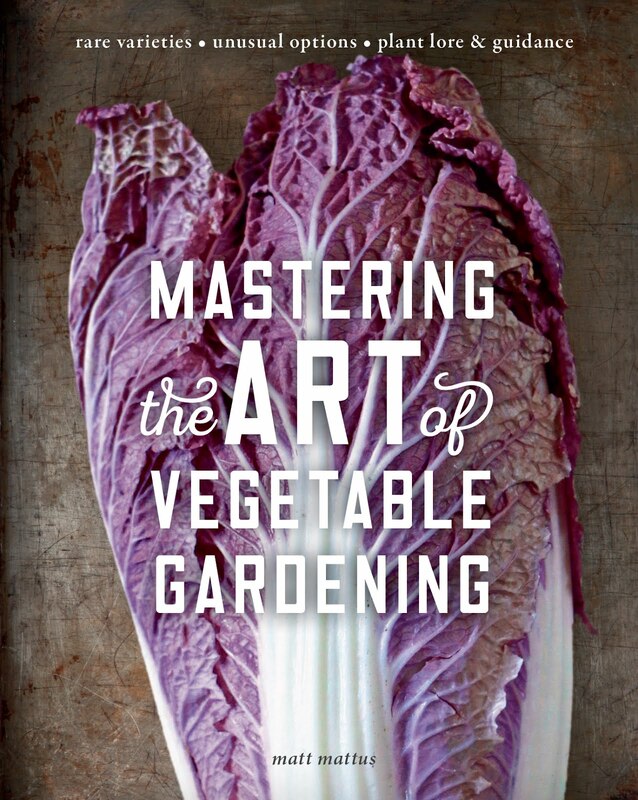 I Finally Wrote a Gardening Book! 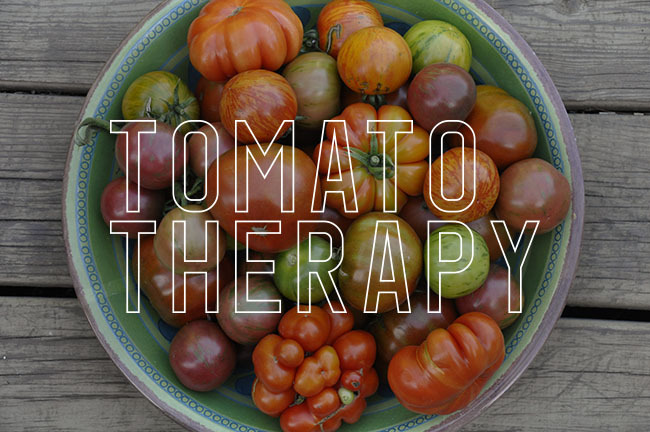 Rating Tomatoes - Which Ones are the Best to Eat and not the ones I grew last year.